Our NightLock Door Reinforcement door guard provides REAL security that works before intruders can enter, saving you time money......and possibly much more. the hinges, and the locks. If you don't reinforce all three areas the door can still be kicked in. kicking in a door to provide access for the bad guy. 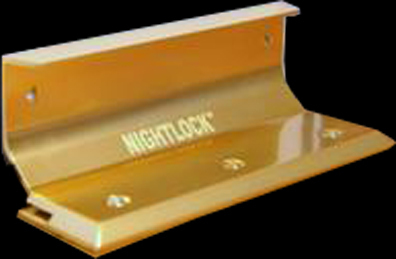 Our door NightLock will keep your door closed and the bad guy on the outside. of your home your level of security is reduced when you need to leave your house. The installation of our NightLock product will provide you a level of security at night that we have not been able to provide with other products currently available. from the garage which if locked by a good garage electronic door will increase your exposure to attack from the door. The NightLock comes in a variety of colors including Brass, Satin Nickel & Oil Rub Bronze. Let us show you how easy we can make your front door stand up for you when you need it most.